Selected issues of the East Village Eye: Summer 1980, September–October 1980, October 1982, April 1984. From the moment the first issue of the East Village Eye hit the streets, in January 1979, this independent paper, published on a shoestring, became the voice of a dynamic new downtown scene. Under the direction of Leonard Abrams, it would have an eight-year run, ultimately totaling 72 issues. During this time—beginning in the 1970s with the explosion of new music at CBGB, and subsequently with the proliferation of art galleries in the 1980s—the East Village was transformed from a slum into a fashionable neighborhood, with destination boutiques and restaurants. The Eye covered it all: neighborhood drug busts, hip-hop’s migration downtown from the Bronx, radical changes in fashion and film, gentrifying yuppies. 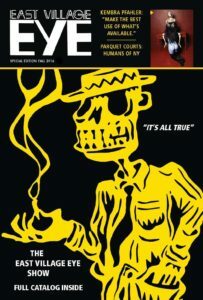 The new issue of the East Village Eye includes an exhibition catalogue. This Thursday, as part of its Eye retrospective exhibition, Howl! Happening gallery hosts an evening of readings, with a group of authors led by Bob Holman and Max Blagg reciting the work of deceased Eye contributors and contemporaries Kathy Acker, Cookie Mueller, David Wojnarowicz, and others, and screening a video of the last reading by late poet and critic Rene Ricard (at the Eye‘s 2013 website launch party). Available at the gallery will be copies of the new Eye “special edition” that serves as a catalog for the exhibition, with essays by Abrams, Walter Robinson, Anthony Haden-Guest, Coleen Fitzgibbon, and Sylvia Falcon. Gallery 98 continues to carry a comprehensive inventory of Eye back issues. Of special note are the highly collectible first issue, featuring a cover illustration of no-wave musician James Chance; and John Holmstrom’s June 1980 cover story “The Death of Punk” (to be followed five years later by Eye art editor Carlo McCormick’s notorious column “East Village, R.I.P.”). Other treasures include a cover story on Robert Mapplethorpe, an early interview with Keith Haring, and centerfolds given over to the work of Futura 2000 and other rising artists. Out-of-town purchases will come with a complementary copy of the Eye special edition while supplies last. 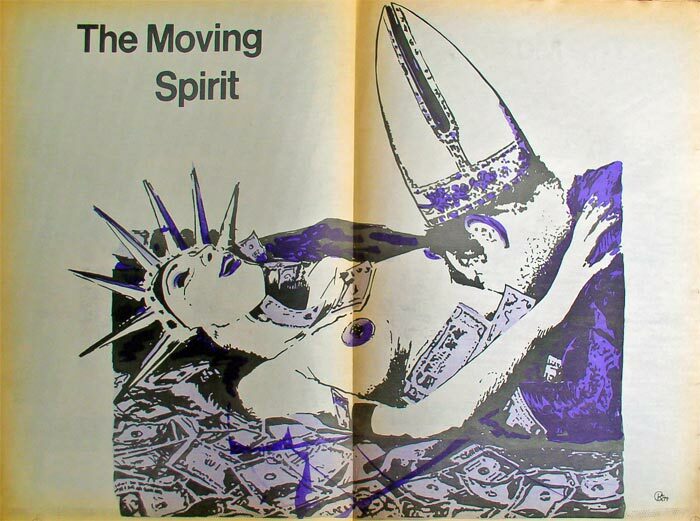 Centerfold by original art director Christof Kohlhofer from the October 1979 East Village Eye. Centerfold by Jane Dickson from the March 1983 East Village Eye.